Extrusionstechnik GmbH presents its products at the Plast. 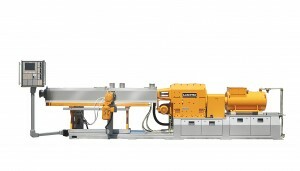 Milan (May 8th, 2012) – The ZSE MAXX twin screw extruders with screw diameters of 18 to 180 millimetres are well known as very flexible and versatile machines. „The Leistritz extruders have established themselves in the market as high-tech machines with a remarkable wide processing window and low energy consumption“, Anton Fürst, managing director and head of sales at German Leistritz Extrusionstechnik GmbH explains. The outstanding features of those machines are impressively dem-onstrated with the ZSE 60 MAXX which is displayed at the Leistritz stand on this year’s Plast. “With this extruder for example we can realize top throughput rates in various fields of compounding”, illustrates Fürst. “An example: when incorporating 40% of glass fibres into PC, throughputs of up to 1.3 tons per hour can be achieved.” Such a result is made possible by the innovative ZSE MAXX technology. With a high free screw volume (OD/ID = 1.66) and a very high specific torque of up to 15 Nm/cm³ the extruders facilitate maximum results. The combination of high volume and high spe-cific torque allows for a disproportionate throughput increase at reduced energy consumption. The co-rotating intermeshing twin screw extruders of the ZSE MAXX series are the flagships of the extruder manufacturer. With the segmented screw and barrel systems as well as the extensive selection of high-end gearboxes and drives, this range of extruders proves to be extremely flexible and therefore highly adaptable for almost any process requirement. The machine concept is based on a platform construction. This facilitates a wide range of modules and a stronger extruder systemi-zation. Furthermore: There are four standard possibilities to position the operator panel at the extruder’s base frame (on the left/right side, at the back or in the front). All this makes the machine well-arranged and very user-friendly. UPDATE 1-Brazil's Braskem eyes shale gas feedstock in U.S.